After a full afternoon of driving, we decided to stay close to the house for our first meal on the coast and made had a reservation at Las Llaves for 7:30pm. When we arrived the restaurant was bustling, with lots of Brits (and tourist pricing). I wasn’t super hungry so I ordered the goat cheese appetizer and sliced chorizo. I also accidentally ate the entire plate of small amuse bouche meatballs because the waiter set it down in front of me with no explanation. Whoops. Eric ordered the pork dish, and we split a bottle of the house bubbles to celebrate making the drive in from Malaga without incident! 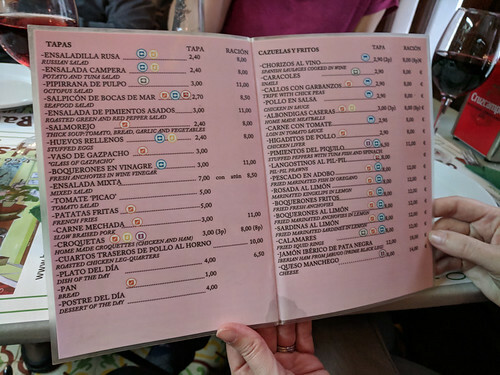 The first restaurant we stopped into in Marbella was white-tablecloth fancy, but after a quick glance at the menu (and discovering no one was hungry enough for a big lunch), we opted for the more casual Restaurante El Estrecho instead. We ordered: Albondigas (Eric); Pollo Higaditos (parents); carne mechada (me) – SO good, rich sauce; Ensaladilla Rusa (parents) – not as good as other versions we tried; Croquetes (parents) and two house wines: one white, one red. Service was efficient and we found certain items to be of better quality than others. 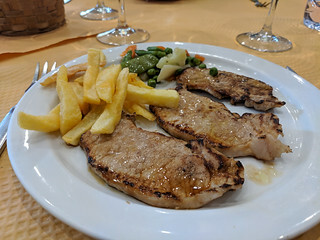 Restaurante El Callaito in Cártama is definitely more of a locals place, but between my okay Spanish and the Google translate app we managed to order all four lunches well! Cazuela de patata and filete de cerdo for Eric – the potato soup was very homey and tasty, and the pork was a little dry but also tasty. I had the ensalada rusa which was rich and full of fish and the fried cod as my main. 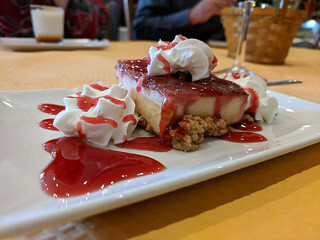 I was the only one who strayed from the custard dessert; I got strawberry cheesecake (below). When we got the bill we discovered the wine was included in the 10€ daily special price too. Bonus! 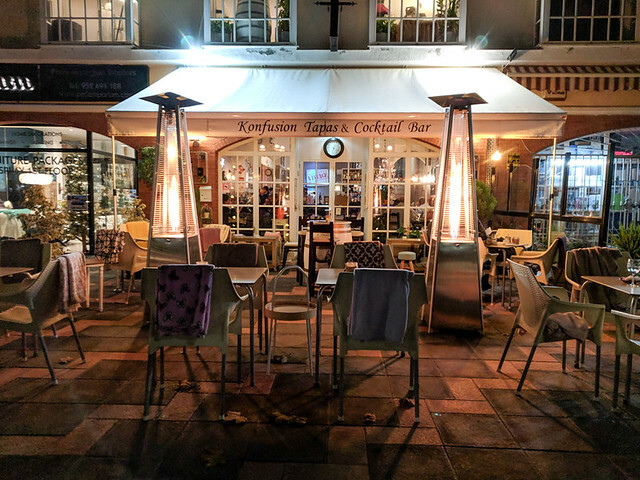 Konfusion Tapas Bar for dinner – we should have made a reservation. We arrived a little after 8pm to a full restaurant and the only option was to sit outside on a chilly night. We grabbed some blankets and a space heater but kept our coats on for the entire meal. Eric ordered the Belota pork (texture was nice, but the sauce of honey and chili was just ok, and the fried potatoes were underseasoned) and the patatas bravas (underfried). I shared the chicken liver pate main which was way too much for Eric’s mom and I to finish. We loved the pate and Eric’s Dad’s stew but everything else was underwhelming. E’s parents returned to this place later in the week (with a reservation) and ordered the favorites again.